With June weddings right on our heels, personalized gifts for weddings are in high demand. Still haven't found an engraved wedding gift for the happy couple? Don't worry. We have plenty of fabulous personalized wedding gift ideas. The time-honored tradition of gifting the bride and groom with a sterling silver or pewter tray has been updated with modern engraving options. Expert engravers are available to create custom gifts for weddings. Our favorite? The Wedding Invitation Tray. Talented engravers are commissioned to digitize the couple's wedding invitation and replicate it on a silver tray. It's a gift they'll love for a lifetime, and it will always remind them of their special day. Looking for yet another variation on the classic gift? Gift them with a silver or pewter tray and an engraving pen. The new engraving pens require no batteries or annoyances; they're equipped with a diamond tip so that guests, friends, and family may sign the engravable trays with the mere pressure of their hand. Have the wedding tray engraved with a monogram to create a centerpiece for guests to sign around. Personalized glassware and crystal creates a celebratory gift for the couple to enjoy as they begin to make a home and life together. Do they love wine? Etched wine glasses are a classic choice. Waterford is always a favorite with a beautiful array of crystal available to be personalized. If Waterford is too mainstream, try the Irish craftsmen at Heritage Crystal. We love the artisans at Susquehanna for their skill and American workmanship that creates unique gifts for weddings. Styles of personalization vary, so think about who the couple is. Are they young contemporary professionals? Idealistically inclined and old fashioned? Choose from the available fonts with their personal taste and the style of the custom gift in mind. 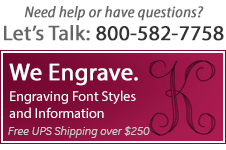 Calling customer service never hurts if you're unsure of how to have a gift engraved for the wedding. Once you're done, the happy couple will have a personalized wedding gift that they'll prize for a lifetime. Award the proud graduate with timeless gifts they'll esteem for a lifetime. From distinctive to traditional, graduation gifts are valued keepsakes meant to honor accomplishment and reward achievement. Gift them with something they'll love with these academically inspired ideas. Picture frames, picture frames, picture frames! With graduation photography coming up and the scholarly memories they've made, they will be sure to appreciate a graduation picture frame. An engraved picture frame can be tailored to their university, school, and the year of graduation. A huge selection of exclusive styles, materials, and price ranges are available to suit every budget and inclination. What new graduate doesn't need a little financial help from time to time? Why not present a little cash in a sterling silver money clip? Handsomely handcrafted, the sterling silver money clips are a gift they'll use again and again, and the cash won't hurt, either. Specifically for college graduation gifting, Arthur Court's collegiate collection is authorized by many universities and features the logos, colors, and mascots unique to each college. Texas A&M, Auburn University, and Florida State University are just a few of the schools represented. Discover all Arthur Court's personalized gifts have to offer new graduates. Cross Pens are a time-honored gift for graduates. Skillfully crafted, their fine writing instruments are perfect for awarding literary majors. Get them started off right with a unparalleled pen "mightier than a sword." Silver bookmarks, personalized flasks, a compass, engraved key chains, inspirational jewelry, and silver cufflinks are a handful of other classic favorites for graduates that you can't go wrong with gifting. Whatever you choose, enjoy the day with them and make sure to celebrate heartily! The loving cup's history is rich in tradition. Customarily used for weddings, feasts, and special events, the pewter loving cup has origins as early as 1811. It has evolved over time to become a classic yet modern corporate award for sporting events, bride and groom gifting, and award ceremonies. The characteristic trophy design of the loving cup creates a presentation piece meant to be prized by the recipient. The two handle design of pewter loving cups honors the union of two people or groups. In the cup's history, each person held one of the two handles and drank from the loving cup in a symbolic union. The loving cup's history and benchmark significance creates a presentation award meant to be esteemed by the recipient. Reinventing the classic, our pewter loving cup trophies feature a non-tarnishing finish that is ready to be engraved with personalization. Often topped off with a lid, the lid of the loving cup is usually crested with a finial. This accent adds decorative height to the pewter award cup. These classic drinking vessels are often personalized to create an engraved loving cup. Corporate logos, monograms, and special dates are popular for personalization. Expert engravers can create a custom trophy out of a loving cup that is historic, timeless, and tasteful. When mounted on a base, the loving cup may be engraved on the body of the cup or on the base if the chosen base is pewter. Different styles and materials are available to add height to the loving cups. Simply choose a style of base that best reflects the event. The loving cup's history makes it a perfect choice for corporate awards, weddings, anniversaries, and sporting events. Find out more about the historical value of loving cups. Our selection of loving cups is available from American silversmiths that take pride in their work and engraving. Browse through our beautiful selection of loving cups inspired by the original design. Any questions about the bases or engraving? Contact our friendly customer service staff. Mother's Day is right around the corner! Gifting is almost always last minute. Plan ahead this year with a lovely gift she'll truly appreciate for a lifetime. Make it personal. Getting an engraved Mother's Day gift always shows that thought and planning were expended for the recipient. Ideas like personalized silver jewelry, a monogrammed jewel box, or a sterling picture frame are always in good favor. Instead of just getting her flowers, why not have a silver or pewter vase engraved with her monogram and fill it with fresh blossoms from the garden? Pewter is non-tarnishing for easy care, and it is polished by hand to a bright luster that rivals sterling. It's much more attractive than the standard thin glass vase most florists use, and she'll have it to prize and use over and over again. Always a classic, a well-made jewelry box is a traditional gift that could become an heirloom. Fine woods like teak, mahogany, and African hardwoods create some of our favorites. Select a jewelry box for her with quality hardware and finishes for a keepsake that will stand the test of time. A sterling silver picture frame is yet another classic choice. With today's updates to photo editing, an old and cherished photograph can be enhanced and reprinted to capture and highlight a beloved memory from her early motherhood. Frame it in a personalized sterling silver frame, engraved with the date or names, and she'll have something to love for years to come. Lighten up the entertaining load and keep guests cool with an Arthur Court beverage server. Featuring favorite patterns, these stately servers add height and drama to the tabletop. Each design features unique cast aluminum details meant to shine. Some of the beverage servers feature a beautiful footed design to add height while others offer a simple and striking glass base. A decorative finial tops off the lid of many of Arthur Court's beverage servers. Themes like the clusters of fruit from the very popular Grape Collection accent each piece with a distinctive touch. The stainless steel spouts are easy to clean and graciously serve a variety of frosty drinks to a thirsty crowd! For a homemade and summery touch, add lemon slices, sprigs of mint, and hunks of fresh pineapple to tea, ice water, and lemonade. The see-through glass body of Arthur Court's beverage server allows these pretty and natural trimmings to stand out. The dappled glass adds an additional texture to these unique serving pieces. Looking for more? The drink servers are just the beginning of Arthur's unique entertaining gifts. No matter what the event, a glass beverage server is the way to serve drinks easily and elegantly. The simple and functional designs easily quench thirsts on hot summer evenings. Guests will never be kept waiting when an Arthur Court beverage server is on tap. The Kentucky Derby is a favorite entertaining event perfect for tailoring to the equestrian set. It's an elegant theme to center parties around, and it's easy to do with a few simple ideas. Roses, roses, roses. What could be better for table arrangements than the classic derby flower? Beautiful and timeless, roses are easy to arrange and perfect for unexpected surprises. Have a handful of julep cups but not enough for the crowd? Fill the julep cups with beautiful red roses for centerpieces at the Kentucky Derby party. Serve mint juleps. Everyone will expect it, and they're absolutely delicious. A chilled pewter or silver julep cup is the perfect way to serve a julep. Muddle 7 mint leaves and sugar together in julep. Add water and swirl to blend with sugar and mint. Top up the glass with crushed ice and pour in chilled bourbon slowly. Finish off with another layer of ice and two or three sprigs of mint. Silver Gallery's collection of Arthur Court's themed derby serveware is an affordable and attractive way to begin adding derby designs to entertaining. Beautiful equestrian motifs paired with the stately spires of Churchill Downs add an immediately personal feel to decor and serving. Serve a variety of expected appetizers along with some signature favorites. Cucumber sandwiches, savory pastries, and delicate sweets keep Kentucky Derby parties simple and elegant. Derby pie garnished with sprigs of mint is a favorite way to finish off the evening. Don't forget to wear a big hat! Having a few on hand for guests to wear if they've forgotten theirs is a practical and festive solution. Enjoy the great southern tradition on the first Saturday in May with all the grandeur and charm you can conjure! The rich history of American silversmithing is as old as America itself. From lavish European inspired designs to established Federalism, sterling silver is in itself a tradition that grew with America. During the 1700's, sterling silver's design focused on characteristic Roman, French and even Egyptian forms. As America grew, styles changed to incorporate the luminous motifs of the United States. Presentation pieces began to arise like Tiffany & Company's Magnolia Vase. This exquisite design was inspired by Native and Latin American styles rather than European. Art Nouveau shortly followed and began illustrating the fusion of old forms and designs with a new and cleaner ingenuity. The changes in silversmithing reflected the changes in the world. Silversmiths continue the tradition in American today, but it is a dying art form. Skilled artisans struggle against a new economic world, but they continue to struggle with the help of devoted customers. Artisans like Reed and Barton, Empire Silver Company, and Salisbury Pewter and Silver are American craftsman worth supporting. Silver Gallery's tradition of supporting American silversmiths is an ideal we continue to strive for by showcasing their designs and searching for new talent in the United States. Reed and Barton has been creating silver in the United States for over 187 years. Their sterling reputation arises from their superb designs and quality. They continue to create pieces like baby cups, sterling silver trays, and shining picture frames. Since 1946, Empire Silver Company has been crafting sterling silver and pewter hollowware. Family owned and operated, their foundry is located in Brooklyn, NY. Handsomely fashioned gifts are highly polished and perfect for engraving. Dedicated to historic designs while remaining afoot of modern inspiration, Salisbury creates luxurious gifts in silver and pewter. Located in Easton, Maryland, they use artistic workmanship methods like spinning, casting, and engraving. The brilliant signature polish of their silver and pewter is a time-honored tradition that requires skill and patience. Take the time to look for American treasures to find a better gift and a better way to buy. The quality, craftsmanship, and value is a valuable national treasure. Don't just buy a gift, buy an heirloom. Mariposa's innovative spring collection brightens up entertaining with superbly polished designs. The selection of gifts adds to beloved patterns and welcomes new collections. Usher in spring entertaining with the wonderfully themed designs from Mariposa's foundry. The Statement Collection is enhanced with new shining pieces in cast aluminum. Personalized with inspirational messages, each gift features gorgeous engraving. Best of all, these pieces are already engraved so there's no wait time for personalization. Celebrating baby, Mariposa's baby gifts are charming and adorable. Favorite collectibles like birthday candle holders, picture frames, and baby cups round out the collection tidily. Each selection is created from a casting and buffed intensely to welcome the springtime baby. Serveware for spring includes extraordinary designs like the Peony Collection. Boldly floral, the richly detailed petals of the peony create a naturally scalloped border for these exclusive serving pieces. The pattern strikingly complements Mariposa's gardening gifts for the outdoors. Seaside designs include the popular sand dollar motif and assorted shells created into sauce dishes and servers. Fantastically coastal, the collection is perfect for gifting and bringing the summer months into decor. Pair with gorgeous blue tabletop linens for an inspiring arrangement. As always, Mariposa's ocean gifts are non-tarnishing with a lively luster. Love enameling? New enameled pieces include bright colors like sunny yellow, pearly whites, and effervescent pinks. Accenting flower designs like daisies, peonies, and geraniums, the enameling is achieved over the sand-cast aluminum workmanship signature of Mariposa. Freshen up the tabletop with some color from enameled serving platters and nut and sauce dishes. The Sueno Collection is augmented with collectibles like picture frames, plates, and servers. One of the newest and most stylish pieces in the collection is an oval server accented by gleaming blossoms. Full of surprises, Mariposa's collections grow and transform seasonally. Entertaining with wine and cheese can be intimidating, but it doesn't need to be. There are a few simple considerations that make it a much easier and approachable party idea. And best of all, you can taste as much cheese and wine as you want to find what you like best. To begin, divide wines and cheeses into couplings, cheeses that pair well with red or white wine to keep the selection rounded evenly. Generally, wine pairing standards are much more casual than they used to be, and guests should be afforded the chance to enjoy what they like. As a rule of thumb, the evening should be started with lighter more mild wines and cheeses and work towards stronger flavors and textures. This can be achieved by grouping wine and cheeses on different tabletops around the entertaining space. Trays, platters, and servers help accomplish this. Two methods are generally appropriate: wines and cheese that harmonize or wines and cheese that contrast each other. For instance, creamy brie contrasts well with an acidic sparkling wine that cleans the palate or harmonizes with a buttery Chardonnay that highlights the creaminess. The idea is simply not to put together a wine and a cheese that overwhelms each other. Don't pair a strong cheddar or Gouda with a mild mannered wine like a pale rose vintage. They have to be able to stand up to each other. Organize party wine and cheeses together with an arrangement of cheese boards and wines next to each other. Some classic combinations are: Shiraz and cheddar, blue cheese and a Cabernet Sauvignon, or goat cheese and a dry white wine. Surprisingly, the evening can be perfectly ended with dessert wines and blue cheese generously drizzled with honey. Don't be afraid to put together what you enjoy the most-- that's the whole point of the experience. The Gourmet Sleuth has a beautifully organized chart for when perfection is desired. Don't forget to offer temptations other than cheese. A break from the many different flavors on the table will give guests a fresh start when trying a new cheese. Fruit like figs, grapes, and strawberries are popular and easy to prepare choices. Present in a beautiful fruit bowl for a pleasing display. Nuts and cured meats thicken out the table while breads and crackers are a neutral between tastings. More complicated hors d'oeuvres are always in good taste, too. Options like a French baguette topped rich roasted eggplant goes well with red wine while a crab dip would pair well with a dry Riesling. Always remember to serve non-alcoholic beverages like sparkling water as well. With lots of wines on the menu, this helps to keep the palate cleansed and gives guests an opportunity the take a pleasant break. Frozen fruit like grapes and blueberries look beautiful in glass carafes of sparkling water. When in doubt, one of the easiest ways to throw a wine and cheese party is simply to pair the wines of a region with cheeses of the same region. Focus on French wines and French cheeses or the more affordable and delicious options from California or your particular locale. Mark the evening as an event for desserts with options like Moscato, ports, Sauternes, and sparkling wines. Serve cheeses like mascarpone and fruit with complex blue cheeses. Narrowing a theme for the evening can make the event much less complicated. Remove cheese from the fridge about 45 minutes before serving to allow it to emerge to room temperature. Chill white wine beforehand and open up reds to allow them to breathe. Prepare a list of the wines tasted for guests to bring home on beautiful stationary. Include a thank you message for guests' participation. Most of all, the hostess or host has really a single goal and that's to make sure everyone enjoys themselves. Allow guests to be comfortable with what they taste with carefully planned out guidance through placement and arrangement of the wines and cheeses. After all, entertaining is meant to be fun!